"The designed interface differs from the existing methods of acting on brain neurons: it uses a fiber-optic channel to transmit signals from an artificial electronic neuron to a live one (Fig. 2). At the same time, unlike in the known optogenetics methods, there is no need to perform technically difficult and expensive genetic modifications of neurons for stimulation. Stimulation of living neurons is carried out with the help of an electrical signal obtained using photoelectric conversion at the output of the optical fiber," Svetlana Gerasimova says. "Besides, optical fiber provides another important advantage: the effectiveness of the interface in terms of affecting brain neurons can be increased by using an active optical fiber instead of a passive one. Thus, adaptive stimulation will be possible and its effectiveness will depend on the current state of the fiber optic channel, which reproduces the effects of synaptic plasticity," concludes Mikhail Mishchenko. 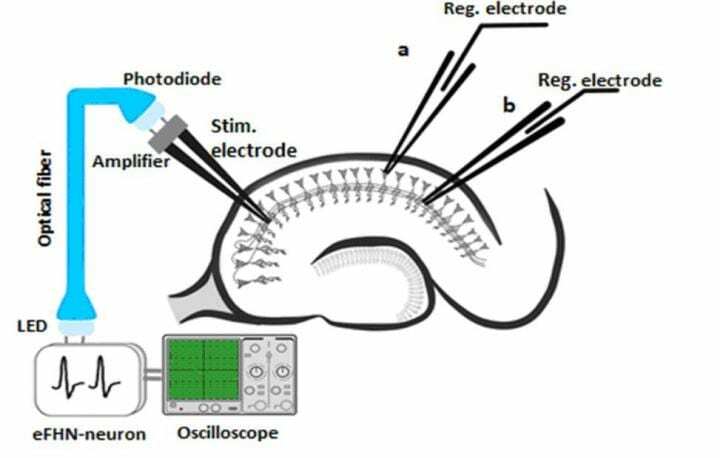 The effectiveness of the proposed system in stimulating the electrophysiological activity of neurons in a surviving section of the hippocampus has been demonstrated. It can be used to develop adaptive systems for restoring brain activity or replacing individual parts of the brain affected by an injury or a neurodegenerative disease.